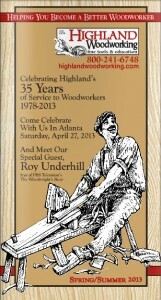 Our newest Spring/Summer 2013 Highland Woodworking catalog is now published and is hitting mailboxes around the country. But if you don’t subscribe or haven’t gotten yours yet, you can easily access the full catalog on our website HERE. Unlike our past online catalogs, the Summer 2013 catalog is now able to be viewed by iPad and iPhone users as well! Just go to the catalog website and the full catalog will appear on your screen. You can flip through the pages with the arrows, just as if you had it in your hands. If you just love that feeling of being able to highlight or mark up your catalog, and haven’t signed up to receive the physical catalog by mail, you can do so HERE.